The stunning newly renovated Fort Lauderdale Residences Hotel is the perfect escape in the ultimate location at 3101 Bayshore Drive Fort Lauderdale FL 33304. Sitting on A1A and overlooking golden sand beaches and miles of sparkling blue ocean, this oasis captures the calm, yet cool aesthetic that sets it apart from other hotels. Just across the street from the beach and nestled amongst all the action of Fort Lauderdale Beach, the hotel is right in the heart of beachfront shops, dining, and nightlife. Las Olas is only a short 2 miles away from where guests can stroll and enjoy this European style shopping and dining experience. Master bathroom includes designer vanity tops, fixtures, faucets and accessories. Enjoy a premium spa bathtub and separate oversized shower open to the master bedroom with views through the balcony. In addition to the amazing amenities listed please visit the W Fort Lauderdale hotel website or contact manager for additional details or recommendations. Special Conditions ONGOING RENOVATIONS: DECEMBER 28, 2016 – MARCH 31, 2017 Until March 31, 2017, construction on a new restaurant will be occurring outside the hotel. During this time, the hotel will remain fully operational, offering all services. All efforts will be made to keep noise and disruption to a minimum. Please contact the hotel for more information. walker rentals said it was too bad that I signed a contract that indicated free parking because there is a clause that enables the hotel to make changes to the rates at any time. However the hotel management waived the charge because of the length of time I was staying. Walker Rentals did not ask. When I arrived the tv's kept cutting out. This was a hotel problem. The icemaker didn't work and 2 days later I found out the washing machine needed replacing. The fridge stopped working completely after 2 weeks. It was not replaced before I left. I had a mini fridge. The light above the dining table didn't work. The kitchen had cockroaches. The waste disposal died as well. Apparently the appliances weren't replaced when the hotel was renovated. Other than that everything was good. My stars are based on the unit not the hotel. Re the icemaker I was told by Walker I could just open the door and stick my hand in to get ice. I was also told I had to be in the unit when the repairman came. That was later changed. I guess because they were coming so often. The unit was missing a fire extinguisher needed for inspection. Hopefully the other units are in better repair. The unit is very nice and fully stocked with everything you need other than food, of course. However, checking in was frustrating. We wanted to check in early but felt that $100 for a couple of hours was unreasonable. We offered to pay $50. No response from owners for 4hours. We tried to check in 30 minutes early and were told we need to wait until exactly 4:00. Condo was outstanding. Service was top notch. Everyone was extremely pleasant and hospitable. Lovely place for a weekend! Lovely unit that was pretty much exactly as described. We've traveled extensively and like to stay in places with a kitchen and services to allow the most flexibility. Overall its a great place, but a couple of picky details keep it from a full 5 stars: 1. Balcony slider in the living room doesn't open. Can't really claim it has 2 balconies if you can't access one of them. 2. Ran a bath on our first night, and the water was Sprite green. No smell or anything else - just an unusual green shade for bath water! 3. Toilet area always had a slightly funky smell - not bad, but a little 'off'. 4. Super picky, but no tissues. Either bring your own, or blow your nose on toilet paper. This vacation rental was our saving grace. My family and I had rented another location and it did not turn out good so we had to cancel it. I called Walker Vacation Rentals and they were so kind and understanding. They were able to set us up with a room the day off for the entire week for a great price. We had free valet all week which was so nice. The condo also provided us with 2 beach chairs and a beach umbrella, which was so nice to have on the hot sand. The only downfall to this rental was that the toilet room had a funky smell. I think it just had something to do with the cleaning products being used for the property. Overall I would recommend this rental property to anyone and everyone. It&#x2019;s right next to the beach and had everything you would possible need!! My husband and I stayed at one of the privately owned residences. When we first entered the residence the first thing we noticed was that there was an overpowering lavender smell which we later found out was to cover a different smell coming from the toilet area. After the lavender scent wore off the entire rest of our stay which was 4 days and 3 nights we had an awful smell coming from the toilet. Although the toilet was closed off by a separate door the minute you open the door the smell would enter the residence. Another strange feature of the residents was that the bathtub was in the bedroom which was quite awkward. Additionally you have no privacy while in the shower as you can sit in the bed and see the other person showering through the door which was not frosted unlike the door for the toilet. Our balcony appear to be cut off in the middle and we could not open either of the doors to get to either side of the balcony. By looking outside at the balcony chairs and table through the doors because we were not able to go out we could see that they had not been cleaned similarly inside the residence was not as clean as it could have been. 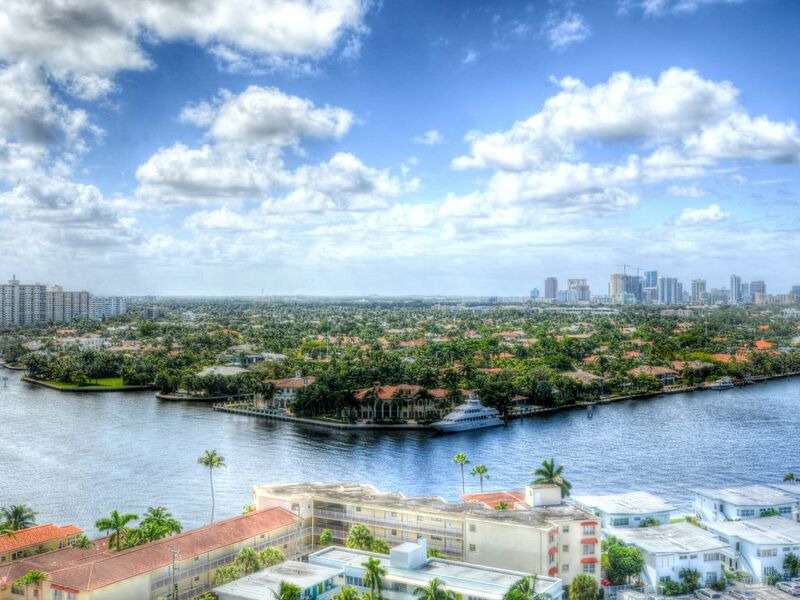 This beautiful 1 bedroom suite is centrally located between Miami and Palm Beach in the heart of Fort Lauderdale Beach. The suite is located Oceanfront and Beachfront with easy access to the best of South Florida. You are minutes from famed Las Olas Boulevard where a range of dining, shopping, and entertainment options are available. Boat and fishing charters are a short drive along with golf options at both private and public golf clubs. Whether you are looking for the finest restaurants and shopping in South Florida or a causal waterfront retreat near the beach, this location has something to offer. RENT PAYMENT & SECURITY DEPOSITS: The initial security deposit and first payment for the Reservation is due at the time of electronic booking. Any balance of Rent due shall be paid at least 30 days prior to Guest arrival unless the subject property will be occupied by Guest within 30 days or less following the making of the Reservation in which case the entire rental amount shall be due. All correspondence between owner and rental agent and Guest shall be via electronic means. Guest will automatically receive an invoice when payments are due. All payments shall be processed through vacation rent payment with both credit card any check options available. Please note there is a $50 charge for all returned checks and chargebacks plus the cost of collection. Guest agrees the use of the rental agreement acceptance and payment processing system through vacation rent payment processing service or other service acceptable to owner without an original signature. Guest agrees payment authorization cannot be revoked.